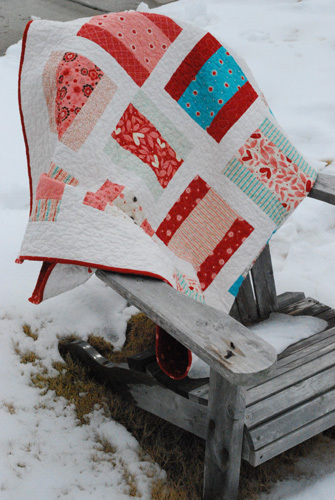 My Be Giddy quilt has been complete for some time, but it took awhile to actually snap some photos. 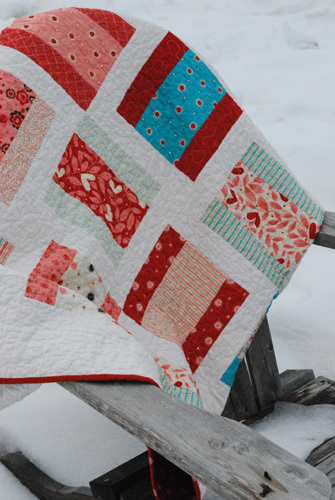 I absolutely love this quilt (don’t I say that about all of them?!? ), because the colors are so cheerful. I used the Piece of Cake 2 Pattern, by Camille Roskelley @ Thimble Blossoms. 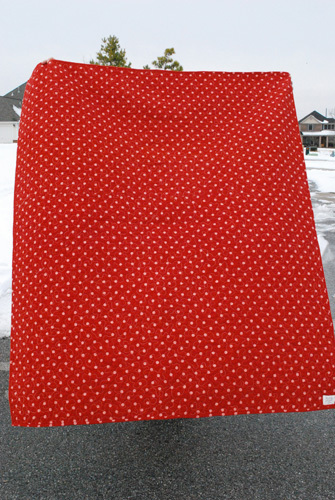 It’s a great layer cake pattern, and I love how the pattern shows off the fabrics. The post wash measurement is 56 x 66. And this yumminess is all for me! 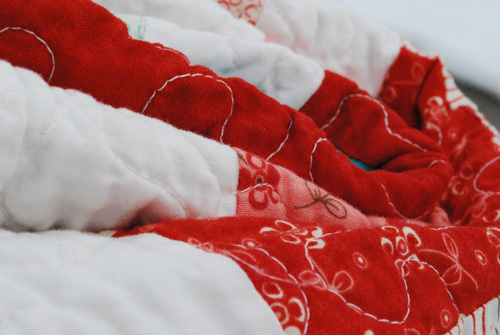 When I washed the Black, White, and Red All Over quilt, a bit of the red bled onto the white. 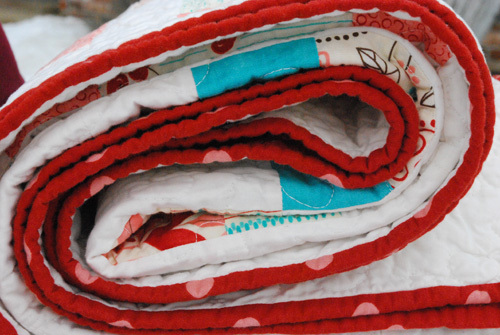 I was able to get most of the bleed out with stain stick and multiple washes, but ever since that experience I’ve used 2 or 3 Shout Color Catcher each time I was a quilt (especially quilts that have red and white). Boy am I glad I did this time. 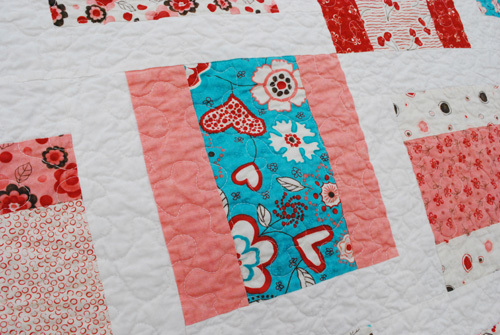 The backing for Giddy is red with pink dots and the front has lots of white. 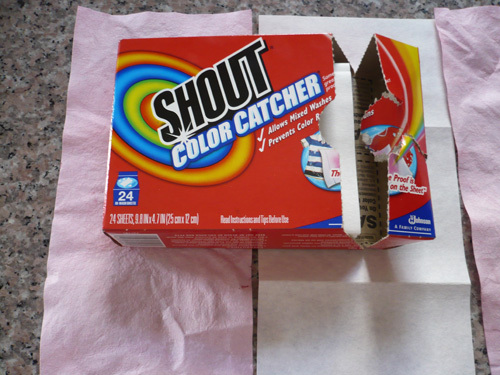 I’m certain had I not included the 3 color catchers, some of the white would’ve turned pink or red. 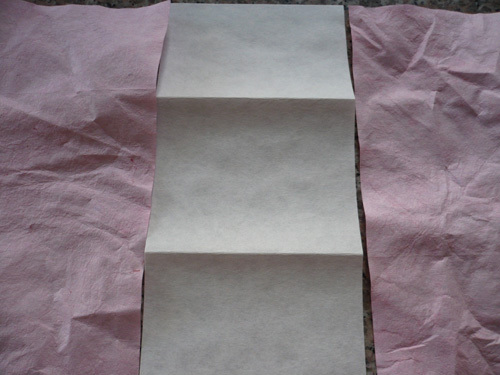 2 color catchers from the wash load sandwiched between a fresh out of the box sheet. They definitely caught lots of color! I completed the Giddy quilt top a few nights ago, and on Tuesday evening while we watched the Sugar Bowl (and sadly watched the Hogs lose), I decided to pin paste the quilt. 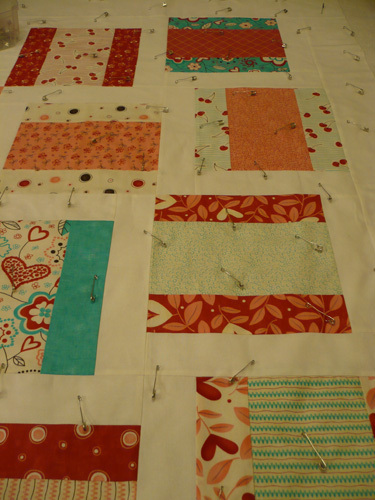 So I unpinned that section and got out my handy seam ripper, and I got to work. 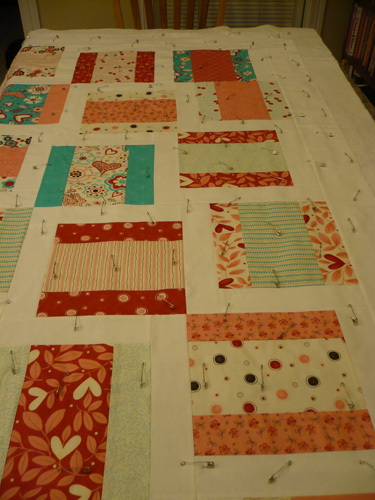 I then rotated the block and sewed everything back together, and then repinned that section. Now that looks better, and more importantly I feel much better! The NJ Blizzard of 2010 hit while were there, and since we were trapped in the house for 3 days, one of the things I did to occupy my time was shop. What did I shop for? Fabric of course! Above All Fabric was having a fabulous sale, and I just couldn’t resist. Today my mail man delivered my goodies, and well, I’m drooling! Some of the fabric is to make some skirts for my daughter, and hopefully I’ll have time to do that really soon! 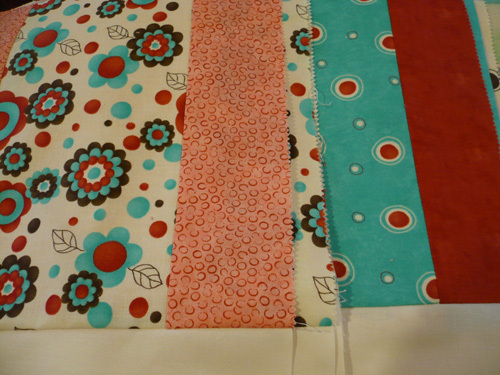 Here’s the layout for the Giddy quilt I’m working on. I’m so loving this line!!!! Oh it’s so good to be home. I missed my sewing machine! 😉 I missed being creative. 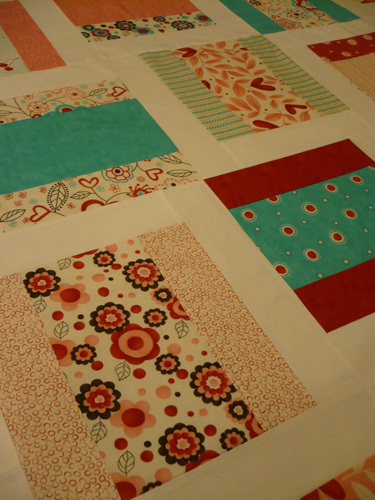 This afternoon I was able to retreat to the playroom/sewing room and I continued to work on the blocks for my next quilt. I started the blocks before we left for vacation, and it was nice to get back into the swing of things. This is going to be a fun quilt. 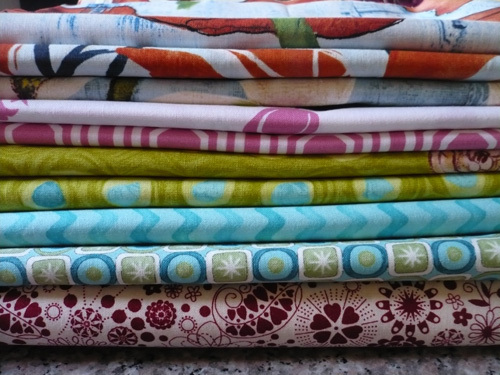 How could it not with this very fun, happy fabric called Giddy by Sandy Gervais?!?! It makes me happy just looking at it. 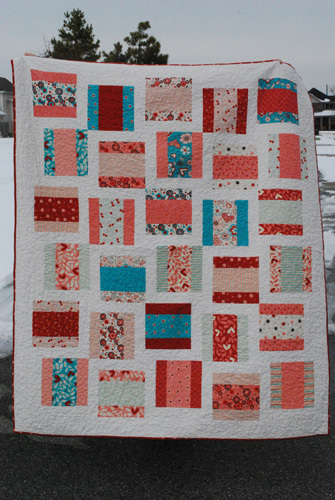 Best of all, this quilt is for me, and it’s been quite awhile since I made something for myself. 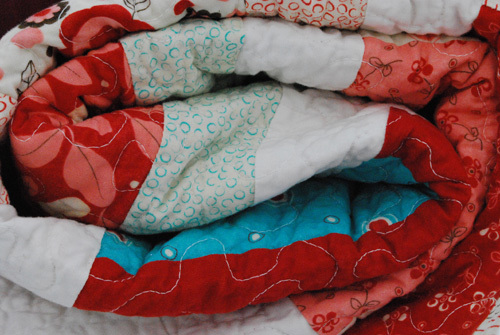 I have a (long) list of quilts to finish or make for other people, but I really want to make this one for me first. 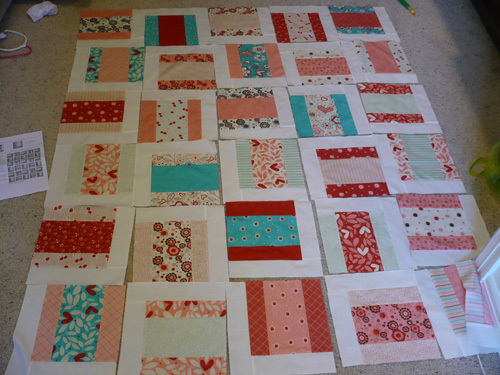 The blocks are done, and now I just need to arrange them and sew the top together.